Located in the Hiwan Homestead’s Heritage Grove in Evergreen, Colorado along Meadow Dr. Enjoy this juried fine art show under the pine trees of the cool mountain air along with local music, food and drink. The Evergreen Fine Arts Festival is celebrating its 50th year. 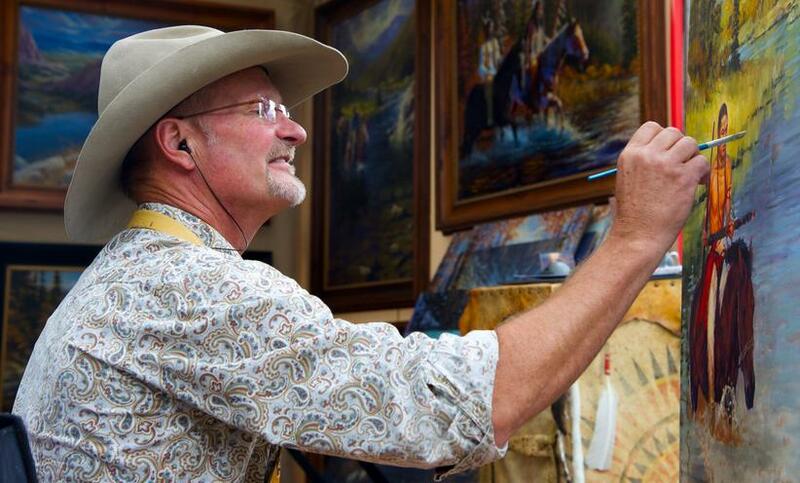 Held in the Heritage Grove at Hiwan Museum, Evergreen, the local artist community has come together to put on a beautiful show for art lovers and collectors for the Denver area to enjoy the arts in the cool mountain air during the height of summer. The 2014 festival was ranked in the Top 100 festivals by Art Fair Source Book. Our festival came in at number 46, directly behind 45th ranked Crested Butte Fine Arts Festival, and not way too far behind the Cherry Creek Fine Arts Festival. The Festival presents original artwork from a wide range of mediums – Sculpture, Painting, Wood, Photography, Jewelry, Glass, and other imaginative and creative work. We invite you to enjoy our well-loved festival. Formed in the Front Range of Colorado, Ponder the Albatross plays a variety of different genres of original music with a little bit for everyone. They are an experimental Folk/Rock/Grass band with a variance of Fiddle, Drums, Bass, and Mandolin/Guitar depending on the song. Ponder the Albatross is a very original, and high energy band with original songs from reggae to trippy instrumental to folk/rock to bluegrass, and cover songs varying from “Queens of the Stone Age” to “Reggae Shark,” that will keep the crowd up and having a good time – one of the best up-and-coming bands around. Local Evergreen musicians John McKenna, John Erlandson, Kyle Wilson, Warren Rose, Rich Jacobs & Lisa Delia make up this popular band. Live performances include original songs as well as covers (with our own twist) from Bob Dylan, Dan Fogelberg, The Lumineers, Ed Sheeran, Incubus, Santana, Michael Jackson, Doobie Brothers, R.E.M., Mark Knopfler, Yusuf Islam (Cat Stevens), John Prine, Liz Longley, Little Big Town, Subdudes, Creedence Clearwater Revival and many, many more. on hand to explain their works and raw materials.